When Van't Hoff calculated the effect of solution composition on the gypsum-anhydrite transition a century ago, he solved a significant geochemical problem (Hardie, 1967). Other well known examples of the early use of chemical thermodynamics in geology are Bowen's calculations of the plagioclase melting loop and the diopside-anorthite eutectic (Bowen, 1913, 1928). Except for a few specialists, however, these techniques were largely ignored by earth scientists during the first half of the 20th century. 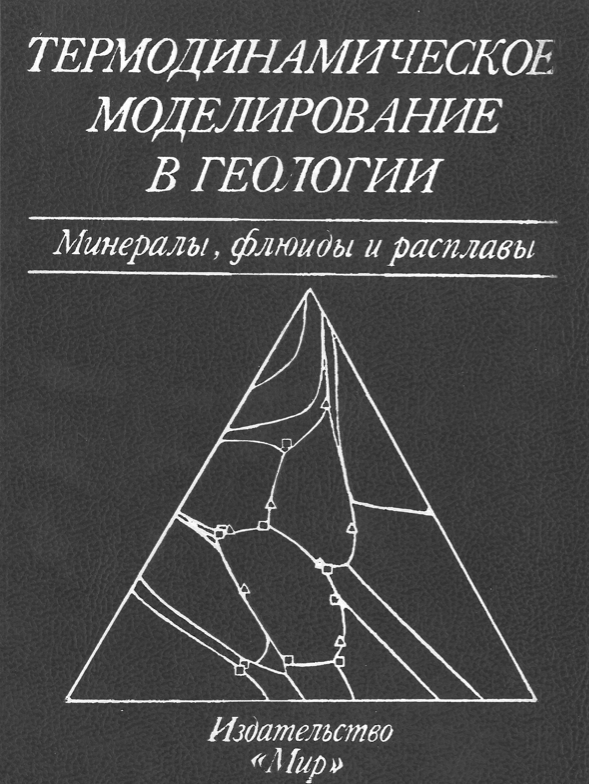 The situation changed dramatically by the 1950's when more and better thermodynamic data on geologic materials became available, and when thermodynamic arguments of increasing sophistication began to permeate the petrologic and geochemical literature. This rejuvenation was spearheaded by D.S. Korzhinskii, H. Ramberg, J.B. Thompson, J. Verhoogen and others. Today a graduating petrologist or geochemist can be expected to have a thorough grounding in geological thermodynamics. Rapid intellectual growth in a field brings with it the difficulty of keeping abreast of parallel and diverging specialties. In order to alleviate this problem, we asked a group of active researchers to contribute up-to-date summaries relating to their specialties in the thermodynamic modeling of geological materials, in particular minerals, fluids and melts. Whereas each of these topics could fill a book, by covering the whole range we hope to emphasize similarities as much as differences in the treatment of various materials. For instance, there are useful parallels to be noted between Margules parameters and Pitzer coefficients. The emphasis here is on modeling, after the required data have been collected, and the approach ranges form theoretical to empirical. We deliberately imposed few restrictions on the authors. Some chose to interpret modeling in the rigorous thermodynamic sense, while others approached their topics from more general geochemical viewpoints. We hope that any lack of unity and balance is compensated for by a collection of lively and idiosyncratic essays in which students and professionals will find new ideas and helpful hints. If the selection appears tilted towards fluids, it is because other recent summaries have emphasized minerals and melts. 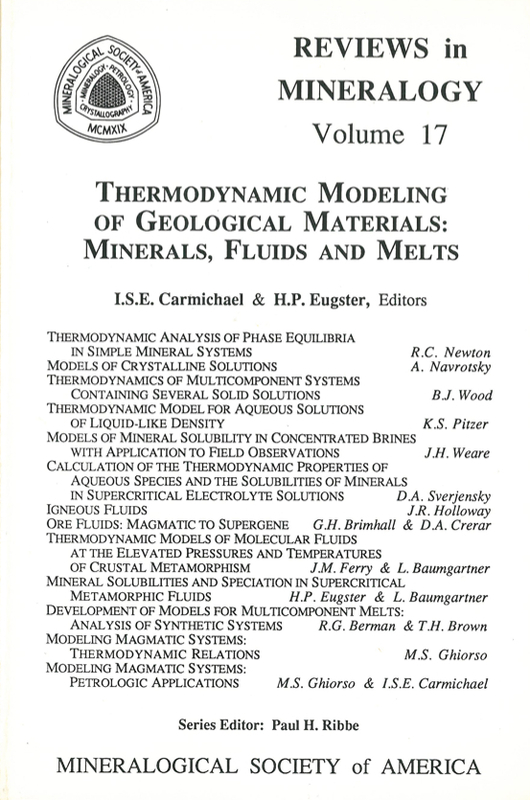 The editors and authors of this volume presented a short course, entitled "Thermodynamic Modeling of Geological Materials: Minerals, Fluids amd Melts," October 22-25, 1987, at the Wickenburg Inn near Phoenix, Arizona. Bowen, N.L. (1913) Melting phenomena of the plagioclase feldspars. Amer. J. Sci. 35, 577- 590. Bowen, N.L. (1928) The Evolution of the Igneous Rocks. Princeton Univ. Press, Princeton, NJ, 322 p.
Hardie, L.A. (1967) The gypsum-anhydrite equilibrium at one atmosphere pressure. Amer. Mineral. 52, 171-200.